Who knows how long the practice of speeding up voices on recordings has been around? One thing's for certain: it was a big trend in the 1950s on novelty songs and/or records made with a very young audience in mind. In 1955, Stuart Hamblen roped family members into allowing their voices to be altered in such a way on "Open Up Your Heart (And Let the Sunshine In)," the unusual result, credited to The Cowboy Church Sunday School, perhaps more suitable for use in a horror movie than a prayer meeting. Buchanan and Goodman used speeded-up spaceman voices in 1956's "The Flying Saucer," the first in their series of subversive "break-in" novelties. Ross Bagdasarian, applying his David Seville persona, reached number one in 1958 with his high-pitched "Witch Doctor." Country star Sheb Wooley also hit number one when he invited "The Purple People Eater" to park his space ship and join the fun. Seville reacted with "The Bird on My Head," then hit number one again when he elaborated on the funny animal idea with "The Chipmunk Song (Christmas Don't Be Late)" by The Chipmunks (soon-to-be household names Simon, Theodore and Alvin). As '59 began, Sascha Burland created The Nutty Squirrels, presenting them as beret-wearing jazz singers scatting "Uh! Oh!" for fun and profit. Jessie Lee Turner ("The Little Space Girl"), The Coasters ("Charlie Brown") and Chubby Checker ("The Class") employed similar kid-magnet voices in their 1959 hits. Technology was running amok! Would this shrill-sounding silliness ever end? At this point Russ Regan had been making the rounds of the Los Angeles record companies for a few years, writing and recording without much success. In 1958 he and singer Laura Lane used the same vari-speed trick on an answer to Wooley's hit titled "Where's My Little People Eater." ABC-Paramount picked up the single, which had been retitled "Junior, Junior, Junior"...Laura, you see, played the part of the People Eater's mother, pleading with him to 'come back' (or at least "phone home"?) while Russ interjected humorously inane comments. In '59 Regan signed with Capitol Records, bypassing any amusing tape-speed gimmickry in favor of teen/rock fare like "Joan of Love" and "Adults Only"...he wrote 'em, he sang 'em, they tanked. He went back to the previous plan after meeting Robert Plaisted; they decided to do a Chipmunks-type tune more appropriate to the holiday season...in other words, with reindeer! Taking Dancer and Prancer, the two leads from 'Twas the Night Before Christmas (the famous poem of the 1820s originally published as A Visit from St. Nicholas), they added Nervous, a shy sort who denied having any worrisome anxiety (with a simple 'Nope! '); once the characters were set, the lyrics basically wrote themselves: 'We are Santa's reindeer...we've learned to sing this year...so we can tell everyone Christmas day is near...' The weirdest (and thus best) part may have been their spoken end-fade: 'And remember, everybody...we're on our way to see you...and you...and...you...' Songwriting credit went to Harold Rustigian (Regan's real name) and Plaisted (likewise) while on the flip side, the music-box-like instrumental "Dancer's Waltz," their showbiz names appeared (Plaisted called himself Bobby Please). Issued on Capitol in November '59, "The Happy Reindeer" by Dancer, Prancer and Nervous made the top 40 the week of Christmas and sold well in excess of a half-million copies, giving Regan a windfall of about 30 thousand dollars, which he promptly spent living it up (at least that's what he told me in the '90s when we were hanging out together at record industry conventions). Soon Russ was back at square one...he needed to write more hits to support his new obsession with greenbacks! 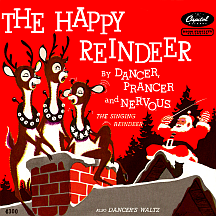 The follow-up single credited the hooved trio as The Singing Reindeer while its accompanying picture sleeve modified the billing to Nervous and the Singing Reindeer; "The Happy Birthday Song" revealed a little spunkier attitude (if it works for the Chipmunks...) while the March 1960 release seemed to be timed better for the flip, "I Wanna Be an Easter Bunny." Either way, it didn't matter. Regan's reindeer lacked the Chipmunks' charisma; they weren't comically argumentative like Alvin....and Nervous was no Rudolph! A few months later, Russ popped up on L.A.'s Candix label with "The Waterboy," a goofy spoken football novelty billed as Russ Regan and the Rowdies with a funny Yale University-inspired 'boola-boola' backing chant/vocal. He supported himself quite nicely as an independent promoter for Buckeye Record Distributors while creating more crazy songs on the side; The Marathons' "Tight Sweater" (penned with Sonny Bono under his Sonny Christie pseudonym) was the closest he came to a hit (but no cigar) in 1961. Russ penned "The Cinnamon Cinder," a top 30 hit for The Pastel Six in early 1963. Right about that time it appeared singing stardom was in the cards with the single "Calling All Cars" ('...there's been a robb-or-ry...this little girl made a fool of me!') under the pseudonym Davey Summers. Bono produced the track (which featured bang-up backing vocals by The Blossoms), a top 20 hit on L.A.'s top 40 stations, first on the Vim label, weeks later on the Zen label, then on Warner Bros. for a shot at the bigtime that didn't materialize. Russ retained his Summers guise for a pair of singles on Dore; he revisited the speeded-up-vocal novelty angle with "Gonna Climb That Big Ole Hill" by Davey Summers and the Singing Ants, then took another stab as a solo with "Teenage Cinderella." He found much greater success as a music executive, working for many labels over a career spanning more than a half-century, his greatest achievement, perhaps, signing Elton John, a DJM artist in the U.K., to a U.S. contract with Uni Records in 1970. As for Dancer, Prancer and Nervous, the one lone hit gave them absolutely zero shot at advancing through animated shorts, features, commercials or anything; we'll never know if Nervous possessed a vibrant personality worthy of inclusion as Santa's tenth reindeer. The heyday of speeded-up novelty records passed with them, though there is the one glaring exception: Alvin and the Chipmunks have remained popular with top-grossing movies, television series, strong record sales and several Grammy awards, a franchise that's held appeal for every generation of children since the late '50s. Meanwhile, one other superstar cartoon character scored a few hit singles while avoiding speed-adjusted audio trickery: Snoopy, Charles Schulz's beloved Peanuts pet, was the main subject of the million-selling 1967 hit "Snoopy Vs. the Red Baron" by The Royal Guardsmen (based on an ongoing storyline in the comic strip). Later that year, the mischievous beagle secured a spot in pop culture's seasonal tradition with "Snoopy's Christmas."